Our selection of Plastic Stemware is perfect for bars, restaurants, clubs, fraternities, sororities, promotions, and much more. Choose from Plastic Martini Glasses, Margarita Glasses, Wine Glasses, and Champagne Glasses, each custom-imprinted with any design/message you choose. Unique themed stems are available in 9 different colors and with over two dozen imprint colors. 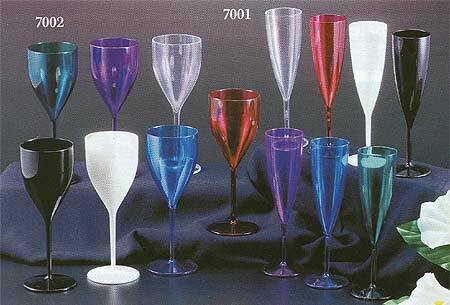 C37 7 oz Champagne Glass 2.97 2.79 2.75 2.67 2.59 2.53 1.75" 2"
W17 7 oz Wine Glass 2.97 2.79 2.75 2.67 2.59 2.53 1.75" 1.25"
G214 14 oz Goblet 2.97 2.79 2.75 2.67 2.59 2.53 2.5" 1.75"
M17 7 oz Martini Glass 2.97 2.79 2.75 2.67 2.59 2.53 1.75" 1"
M610 10 oz Martini Glass 2.97 2.79 2.75 2.67 2.59 2.53 2" 1"
M612 12 oz Margarita Glass 2.97 2.79 2.75 2.67 2.59 2.53 4" 0.5"
M618 18 oz Margarita Glass 2.97 2.79 2.75 2.67 2.59 2.53 4" 1.5"
WS18 8 oz Stemless Wine Glass 2.43 2.35 2.25 2.21 2.17 2.11 1.5" 1.5"
WS112 12 oz Stemless Wine Glass 2.57 2.47 2.39 2.35 2.29 2.25 1.625" 1.625"
WS116 16oz Stemless Wine Glass 2.71 2.61 2.53 2.47 2.43 2.39 1.625" 1.75"
B16 6oz Brandy Snifter 2.03 1.99 1.93 1.89 1.85 1.79 1.5" 1.375"
C157 7oz Champagne Glass 1.79 1.59 1.49 1.43 1.37 1.29 1.75" 2.5"
W18 8oz Wine Glass 3.25 2.97 2.89 2.79 2.75 2.69 1.75" 1.25"
PG114 14 oz Poco Grande 3.25 2.97 2.89 2.79 2.75 2.69 1.375" 1.375"
It's easy to get started with your Custom-Imprinted Stemware – simply call 1-800-233-0828, and then e-mail your camera-ready artwork to graphics@kardwell.com (you can also mail your design). Production time is about three weeks. Rush delivery is available for an additional charge.